Incentro 203 is seen here approaching the Hucknall terminus on 9 March 2004. The subject of this profile is Nottingham Express Transit Incentro 203. 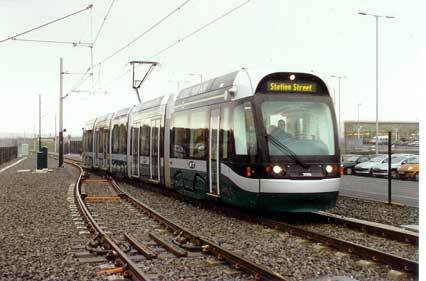 This has been chosen as the tram used for the first public service on the new NET system on 9 March 2004. Like all of its Incentro sisters in Nottingham, 203, was assembled at the Litchurch Lane works of Bombardier in nearby Derby. Many of the components had been constructed at other Bombardier sites across Europe before being delivered to Derby where the trams were put together before deliveries commenced in October 2002. 203 was the second tram to be delivered to the Wilkinson Street depot from Derby following on from sister 202. After delivery the trams were put through a series of tests on the track with the testing gradually building up before the dummy timetable was introduced around Christmas 2003 involving the trams operating on the whole length of the system before the public were allowed on the trams from 9 March 2004. 203 was the tram chosen to perform the first public service on this day, operating the 0558 Phoenix Park to Station Street service. Generally the Incentros are the first trams in the UK to be totally low floor, are fully compliant with the Rail Vehicle Accessibility Regulations and are also the first new trams to operate in the UK (second generation that is) actually constructed within these shores. They are finished in an attractive green, silver and white livery (except the 3 in all over adverts) and have been numbered to carry on from where the first generation trams finished 68 years ago. Inside the trams there is room for 62 to sit and an overall capacity of 190 with ample room for standing. On board the trams there are passenger information displays informing customers of where the tram is going and the next stop on the service and this is complemented by announcements giving the same information. They also have an air conditioning and heating system meaning the trams should be warm or cool regardless of the weather outside along with CCTV which replaces the normal mirrors to check rear vision. It is the plan that all 15 of the class receive names, 5 after local unsung heroes, 5 after county wide figures from the past and the final 5 after county wide figures from today.